My mom is a Peke person. 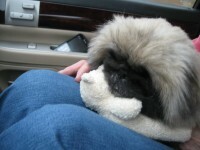 She’s about as crazy about Pekingese as I am about Shiba Inu (and that’s a lot crazy). After having Pekes her entire life, she decided in the late 80s that she didn’t want another dog. I then surprised her with a puppy a couple years later. (Bad, bad, bad, but I had my dad’s permission.) Mother was REALLY mad at me for, oh, maybe 30 seconds… the length of time between her realizing I had a PUPPY carrier and seeing her new puppy’s face. 😉 For the next 14 years, "Poco Tempesta" and my mom adored each other unconditionally. When Poco passed away five years ago, we (the family) all agreed that no one would be surprising Mother with any more puppies. Two years after that, Mignon (who had moved in with my parents after my grandmother went into a nursing home) passed away and my folks’ house was void of dogs. Of course, Snickers and Secret go over there fairly frequently to keep the fur count at acceptable household levels, but it just isn’t the same. A couple weeks ago, Mother was telling me (again) her reasons for not having another dog. Unbeknownst to any of us, Mother had been cruising petfinder.com periodically. 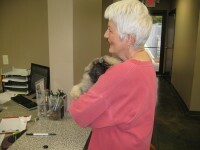 Last Monday, a sweet little neglected Pekingese boy showed up in a shelter in Oxford, MS. I think it was love at first sight for my mom. Tuesday afternoon, we drove to the shelter to meet little “Kudzu.” The shelter told us that he and five other small dogs had been left tied outside their former (closed) facility. 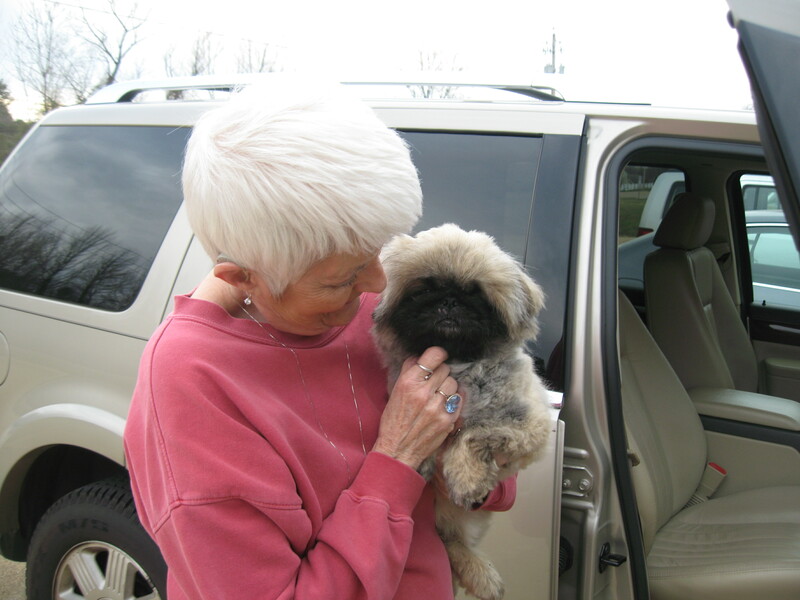 All the way there, my mom was worried about whether getting another dog was the right thing to do, whether he’d be healthy, whether he’d be friendly, and pretty much everything else she could think of to worry about. Once she saw him though… she didn’t want to leave without him! 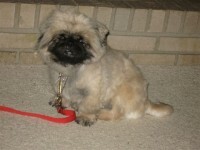 He had been terribly matted, so they’d chopped off all his matted fur and he had the messiest “puppy cut” I’d ever seen. His nails were super long, his eyes were cloudy and his teeth were covered with tartar. At one point, she asked a shelter worker whether she could bring him back if he turned out to have any deadly serious health problems. I thought to myself “She wouldn’t do that,” but I didn’t say anything. The shelter was about to close, so she left her adoption application and we drove all the way back home. She was already making plans for taking him to the vet, buying him new things, picking out a good food. Oh, and she’d already decided to name him ChuChu! 🙂 The next afternoon, she IM’d me that her application had been approved and off we went, back to the Oxford Lafayette Humane Society to pick up little ChuChu. 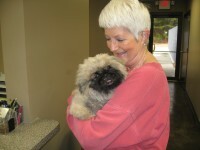 Thursday, ChuChu went to the vet. 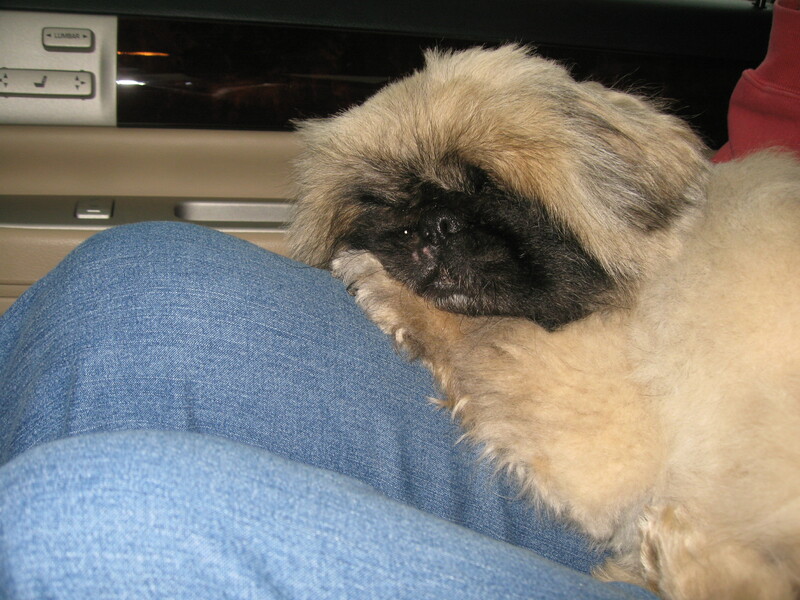 The vet agreed with me that ChuChu has “crazy looking eyes” and confirmed that he is most likely blind. Blood and urine were collected for tests. Rabies shot was given. Testicles were confirmed to not exist. ChuChu was pretty much a good boy. 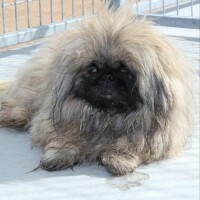 Friday, the vet called and said that, unfortunately, the blood work indicates that ChuChu is in Stage Two Renal Failure. Mother bought some Science Diet k/d and I started the process of gathering research for her to read on care and nutrition for dogs with failing kidneys. Taking him back to the shelter was, of course, never an option. ChuChu in his new home. 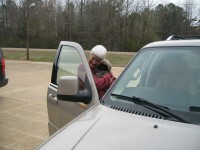 Mother loves this little dog completely; there’s no holding back just because he won’t be around as long as she’d hoped. She didn’t get exactly what she’d bargained for when she adopted ChuChu, but they love each other and she’s committed to giving him the BEST life possible for as long as he’s happy and healthy. Welcome to the family, ChuChu! I love her face when she is holding him at the shelter. Everyday of happiness they can give each other is a gift. Jenna, what a lovely and heartwarming story. Sad that Chuchu is so ill but that little guy is so lucky to have your family taking care of him and loving him at the end stage of his life. Lord knows, after all he has been through, he deserves to be spoiled and pampered. It was meant to be. Bless your Mom she sounds like a very special person. Congratulations to Mom & ChuChu. Happiness is so important…. Bless them both. He’s in the best of hands. Welcome to happiness, ChuChu! Thanks guys. 🙂 ChuChu is definitely one lucky little guy. He couldn’t have possibly ended up in a better home. My mom and dad are both pretty special. It’s no accident that my sister and I both have a deep respect for life.